My interest in engaging with culture to make a difference began with the issue of abortion. In churches and other Christian groups I was hearing one set of facts and information; from the media, an entirely different set. This was the first time I’d really grasped the fact that most people only hear the media-spun side of the story (for many different issues), and the desire was born to learn the truth and present it to people who might otherwise never know. In the case of abortion this would include the emotional and psychological toll on mothers (and fathers), and the increased risks of miscarriage in future, wanted pregnancies. As I began to attend symposia, read articles and listen to lectures, I quickly realised that there are a whole lot of issues behind the ‘frontline’ or more obvious ones, the concepts and philosophies that inform our thinking about what is actually right and wrong in such dilemmas. In the example of abortion, these include questions like ‘what is a human?’ – ie when does a bundle of cells become equivalent to a person? If you believe, as philosophers like Peter Singer do, that rationality and self-awareness are what make us human, then logically, infanticide is perfectly acceptable, because you’re still only destroying cells or a mass of tissue, not an actual person. And this is just one of the many incredibly complex questions surrounding one bio-ethical dilemma. What of cloning, or bio-medical enhancement, or organ donation, or euthanasia? 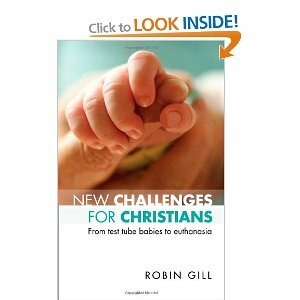 When Robin Gill’s new book arrived at our office, I was pleased to be assigned the task of reading and reviewing it, looking forward to the fulfilment of its back-page promise to “equip [me] to navigate highly disputed territory and form opinions responsibly and with clarity and conviction.” Sadly, I was disappointed. Possibly book’s greatest weakness is its format; it is not so much a new book as a compilation of articles written by Gill for various publications (and some previously unpublished) over fourteen years (1996-2009). Although it is helpfully organised into sections dealing with different areas of medical ethics, the rapid changes in each area over the timeframe mean that rather than forming one coherent thread, each section appears as a journey with no clear conclusion. Gill notes in his preface that ‘sharp-eyed readers’ will notice some ‘shifts’ in his thinking over time. 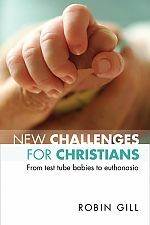 It is thus useful in raising awareness of the complexity of many of the issues involved, but rather weaker when it comes to helping the Christian reader form any clear framework through which to evaluate future developments. In an early section (Gospel values and healthcare today), Gill identifies four ‘virtues’ apparent in stories of healing appearing in the Synoptic Gospels: Compassion, Care, Faith and Reticence. Had he then taken the wealth of thought he has amassed over the years and rewritten it, structured around these virtues, he might have emerged with a practical and workable application. As it is, though the theme of compassion surfaces frequently, the others are notable by their absence. Without a robust framework, including an acknowledgement that Jesus’ compassion was informed by his divine wisdom, ‘compassion’ is a notoriously flimsy concept, which can be used to argue both for and against, say, the creation of ‘saviour siblings’, and which forces Gill to admit that assisted dying may be the most compassionate course of action in some difficult cases, without leaving him any clear guidelines for the caution he repeatedly urges. How should a Christian balance compassion for a distraught teenager who finds herself pregnant with an unsupportive family, with caution over allowing abortion on any but the most serious health grounds? How are we to answer those who say that compassion for sufferers of painful, debilitating, degenerative diseases means killing them? This book raises the questions but offers no answers. I’ll return to this as issues come up in the news – and if anyone can recommend any more helpful books on the issue, I’d love to read them. Compassion and caution are all very well, but clarity and conviction on how to deploy them are vital.